All transactions are safe and secure with a reliable history in online purchasing behind each of our associates. 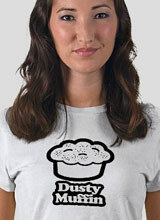 Buy the SNL Betty White Dusty Muffin t-shirt to own Hot in Cleveland clothing and merchandise. She stole your heart as the innocent farm girl Rose and now she is doing it all over again. This former airhead has her head on straight now, not only as the witty Elka Ostrovsky but also in her appearance on SNL. Taking a break from her role as Elka, she appeared in the SNL skit Delicious Dish to promote her Dusty Muffin. In real life, she dedicates her time to animal related charities like Rose. Grab your Dusty Muffin Betty White shirt today if you love her funny side or any of our Hot in Cleveland t-shirts if you prefer her feisty side. For more Betty White tees, check out the related galleries. In addition to the SNL Betty White Dusty Muffin tee above, browse the Hot in Cleveland Clothing Gallery for more apparel like men's and women's clothes, kids shirts or hoodies.